Re: how to flatten this? If you make it a flat 1st wall, you can add a flange on the outside and a flange on the inside. That will flat pattern and unbend just fine. actually i was trying with the sweep option..and then it was not unbending. True, only actual bend operations will flatten. Walls and flanges include a bend subfunction. Forms, for instance will not unbend but they will flatten and provide a tool layout. If you do a joggle offset with a form, it will not add the additional length in the flat pattern, but a joggle flange will. That's interesting that it would let you flat pattern that, because you cannot actually make it like that without extreme distortion and folding of the metal on the cylindrical ends, unless you deep-draw it. It is really not a part you can really "develop". 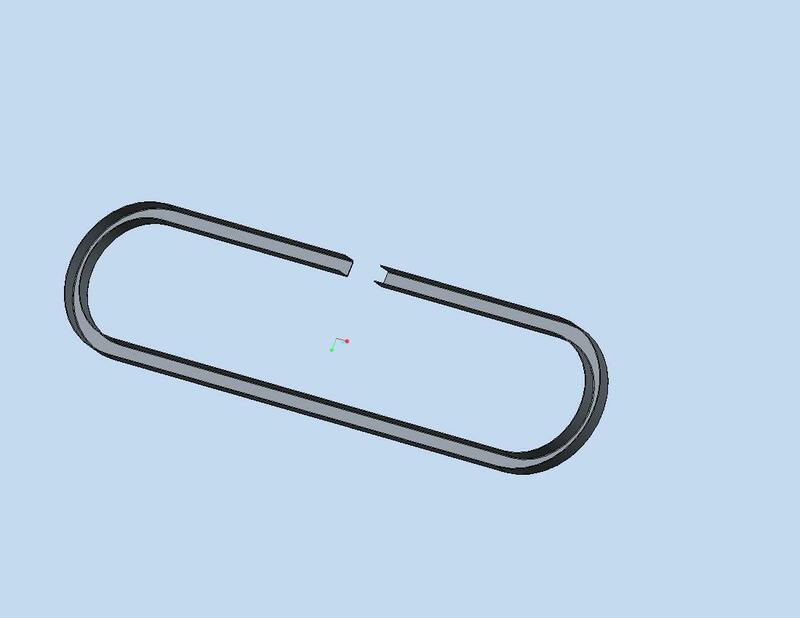 What's even funnier is that car frames use to be stamped to make these shapes so a form tool is actually more appropriate to simulate the actual world process. But as we know, that won't give you an accurate flat pattern either. I think if you stamped Rohit's part, it would actually make that shape with the given flat pattern. The overall skirt height will vary some depending on the amount of stretch that the stamping process will cause. And yes, there will be a whole lot of crushing of the wall too. Typically, the tools allow for "wrinkle room". Yep, in that shape, there's either extreme stretching of the metal (and thinning walls) from deep-drawing it, or wrinkled cylindrical walls from folding it up. That'd probably be a part best deep-drawn IF possible (thin tool between walls), to get smoother cylindrical surfaces. I had a friend who worked for Chrysler at the Twinsburg stamping plant in OH, and it was amazing the things you can do to wrap metal. You get wrinkles, but the auto Mfg'rs are great at hiding that now, usually on the inside. Honestly, if you had the right tooling, the best/fastest way to probably make this is to get u-channel, and bend it into shape. You'd need a wiper die on the outside, support die on the inside, and a moving support die on the inside of the channel to support it and keep it from crushing. They do this in (brass) tubing a lot where they have a cable with steel balls the ID of the tubing, and it's timed so that the balls get drawn thru the tubing to support it as the wiper die bends the tubing. Works really well! I'm sure they could do this here and do it fast and easy.